For every Ying there is a Yang. For every man there is a woman. For every success there must be failure. So of course for every The Hangover (2009) there must be Bachelorette - a cinematic counterpart with blindingly obvious intentions to close in on the opposite market cornered by the successful 2009 comedy. While The Hangover was a film made by men for men, it still contained broad comic appeal. Bachelorette is a movie made by women for women and they have seriously underestimated their audience. 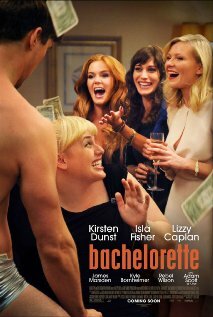 Becky (Rebel Wilson) is twenty something American who is about to marry the man of her dreams. To complete this dream scenario Becky calls upon her high school friends to be her bridsmades and wedding planners. While this plotline may seem all to familiar to Bridesmaids (2011), which replicated The Hangover’s formula of big laughs delivered by small time actors, Bachelorette has something more to offer to the formula: excessive foul language and exorbitant amounts of cocaine abuse. Bachelorette features a perfectly capable cast that can pull the comedy out of a script given the dialogue and direction. Kirstin Dunst, Lizzy Caplan and Isla Fisher have proven this in the past with previous works across film and television. So why isn’t this film funny? The script is generic, vulgar without reason, impersonal and at times completely devoid of humor on any level. The main characters are mostly cold and uncaring towards people and surprisingly each other. This makes its instantly hard to care about them or their circumstance. When the plot reaches the final unsurprising conclusion almost all character disagreements are forgotten or resolved to underplayed, badly scripted comedy and a typical musical montage finale. This is a badly put together film that unfortunately feels like it was penned by a spoilt teenager foreign to the word “No”. It is a juvenile attempt at a one-night circumstance party film. What this film borrows from other comedies it does not expand upon and also butchers without class. A house cannot be built on sand, no matter how sturdy the material, just like a film cannot be built on a bad script, despite the talent involved. The script is the centrepiece to everything that revolves around it and everything that revolves around this particular script should be avoided for your own entertainment value.